Join us as we March! Sign up now to experience the GKP life this summer. Weekly rates! So many fun guests are coming including a petting zoo, magician, clown, storytellers and musicians! Everyone is invited to join us for a fun Saturday Field Trip to Walnut Creek Park Trails. This is a beautiful place in North Austin that has several trails branching all around. There is even a good little stroller-friendly path to take. So our infant buddies should come too! We will start at the covered picnic area then split up and hike around. Meet back for a little lunch then head home for a nice nap time! It’s the perfect time of year to enjoy the outdoors in Austin. Let’s have fun! We will have a Christmas Nappy Time Event in December. We will provide this Christmas backdrop as well as a variety of original costumes to rent. For the backdrop we are making a big snowman, a Christmas tree, Santa Claus flying in the distance, and more. Bring your baby and your camera, and take a dream picture of your baby with our snowy background art. It's a perfect Christmas gift for grandparents, aunts, uncles & godparents! Come to GKP on Saturday 10/20 anytime between 9:00 and 1:00 and take a picture of your baby on our Halloween Themed backdrop. You can use your own camera and keep the pictures right away. There will also be a huge variety of adorable costumes to use. So sweet! From now until the end of 2018 we are running a special promotion for newly enrolling Preschoolers! Maybe you have been wanting to try a better preschool for your 3 to 5 year old but aren’t sure if its the right time. Well NOW is the time!!! We will match the price you are paying at your current preschool if you enroll before 12/31/2018. 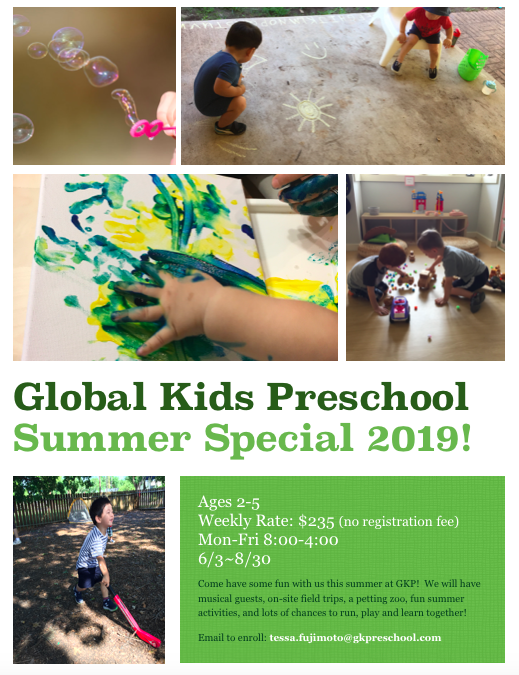 We have an exceptional program here at Global Kids Preschool. Our small class sizes and low ratios ensure that your child gets the individual attention they need during these critical learning years. The best feature about our preschool is…its really fun. We think childhood is a wonderful time of life where kids can develop a love for exploring, playing, and learning new things. Our kids don’t spend their days sitting in desks filling out worksheets. They are on the playground collecting acorns and then bringing them inside to look at under the microscope. The learning possibilities are endless with the Reggio Approach. Do you know that other schools can have 15 to 22 preschoolers with just one teacher? Here at Global Kids we keep a strict ratio of 11 children per teacher. Its just better for the kids. We never charge an enrollment fee, supply fee, registration fee….nada. The only thing you pay is tuition. We offer weekly enrichment programs for ALL of the kids. This means everyone gets a chance to participate in KinderDance, Yoga and Music lessons (not just the kids whose parents paid extra for it) and its included in your monthly tuition. Simple, send an email to our director: tessa.fujimoto@gkpreschool.com and we can do all of the registration online. 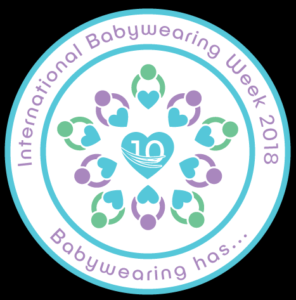 Its International Babywearing Week! GKP will be joining the Austin Babywearing Festival this Saturday from 10:00-1:00 at St. Richard’s Episcopal Church’s Parish Hall. The Community Fair is the largest fundraiser of the year! Visit with many local organizations, play games, participate in the Silent Auction full of family prizes, and browse Austin Babywearing’s HUGE carrier sale. Each adult who attends will also receive one FREE ticket for our many Door Prizes. Babywearing Educators will be available to help with any questions you may have and offer fit checks for your personal carrier. We will also have our ENTIRE lending library available for you to view. We will not be offering library rentals during the event, but will at our main meeting on Saturday, October 13, 10:00 am at HEB Mueller’s Community Room. GKP will team up with our neighbors at Round Rock Garden’s Fall Festival on Saturday 9/29! FIRST 200 GUESTS WILL GET FREE KONA ICE! Dine with Austin’s top rated Taco Truck with Jorge, see the adorable animals from Tiny Tails To You! (petting zoo), get your FREE Kona ice as one of the first 200 guests, jam out to Jim Nosler’s excellent music, and enter your dog in the Puppy Costume Contest! We will be having a special photo event for your sweet baby on Saturday 9/1! Global Kids Preschool was recently featured on KXAN News!! !